Sheet masks are having their time in the beauty world now at least here in the US, and with drugstore-budget brands becoming available, a DIY spa day at home is becoming easier than ever. 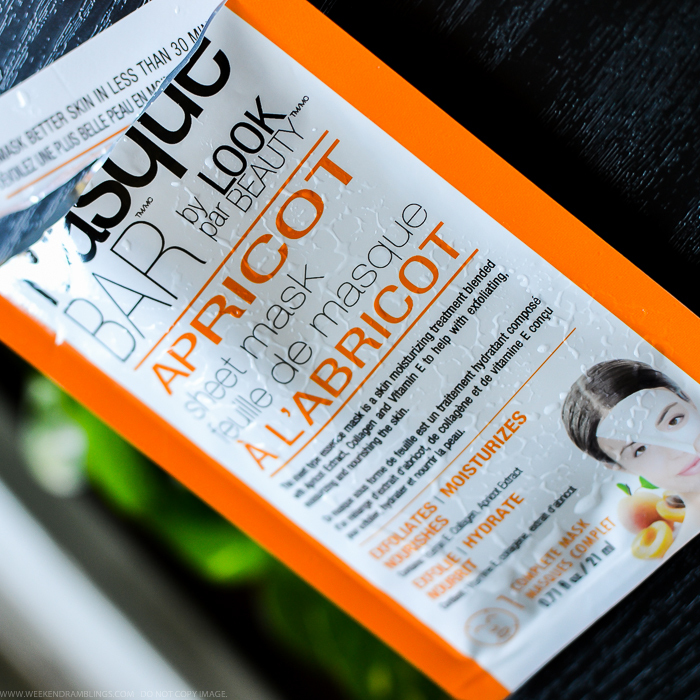 Masque Bar by Look Beauty is one such brand that makes an affordable version of this Asian-inspired beauty ritual. Sheet masks are generally cotton or paper masks that are individually packed and come soaked in a lotion/essence that provides moisturizing, brightening, antiaging benefits (depending on the variety of mask used). 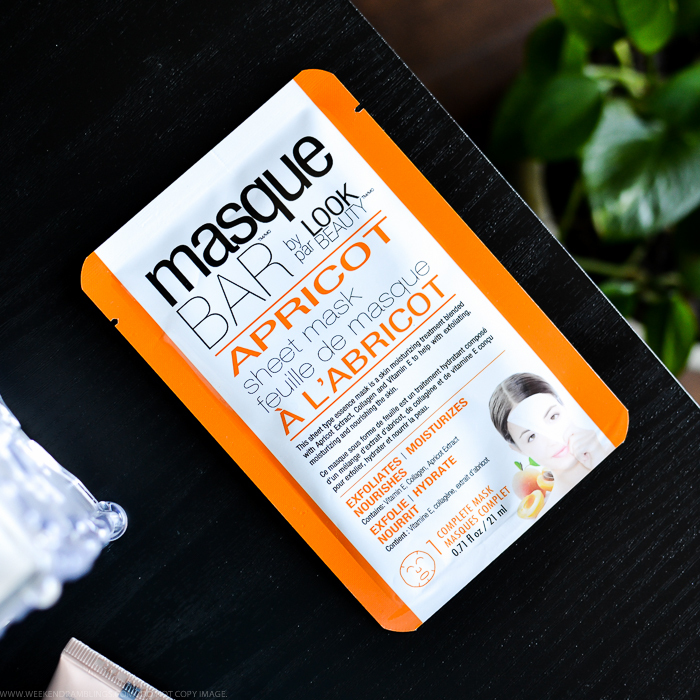 I recently got to try out two of the sheet masks by Look Beauty - an Intensive Moisturizing Feetreat Pedi foot mask as well as this Masque Bar by Look Beauty Apricot Face Mask. 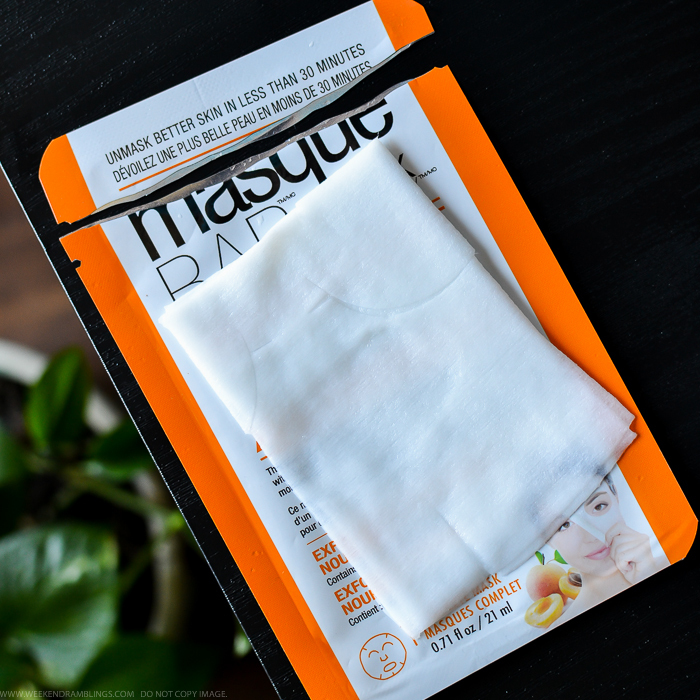 Read on for more photos and my thoughts on this sheet face mask. Masque Bar by Look Beauty Apricot Sheet Face Mask - residue left behind from the mask in earlier pic. Like many of the sheet masks I have tried so far, this Look Beauty Apricot Sheet Mask too is a cotton-soaked-in-essence mask. There are holes cut out for eyes, nose, mouth, with the only slightly different thing being the eye-holes have little flaps under them. 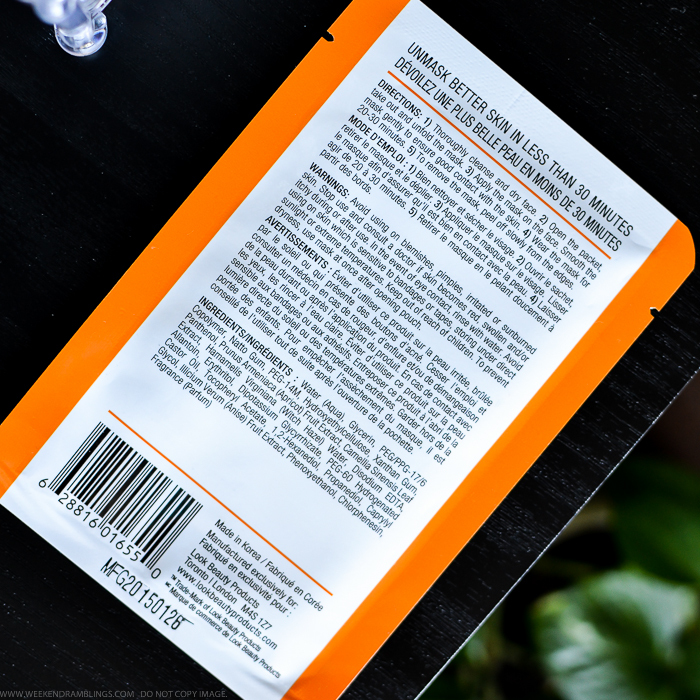 I am not sure if these are for covering the eyes or are just a part of the design, but since this Apricot mask contains witch hazel extract and also is labeled "exfoliating", I didn't cover my eyes and just left the flap folded down. Most times, with cheaper sheet masks, I find that the masks tend to be on the dry side, but the Look Beauty mask comes soaked in a generous amount of the moisturizing lotion (you can see the residue left behind on the packet in the photos above). As instructed on the pack, I applied the mask to clean, dry face, smoothed it so it was in proper contact with the skin, and relaxed for about 30 minutes. My skin felt like it was getting a bit warm, but I didn't have any irritation or redness with this mask, but as mentioned on the packaging, this might not be a good pick if you have very sensitive or easily irritated or inflamed skin. After about 30 minutes, I discarded the mask and massaged in residual lotion into the skin. I did follow with a moisturizer, but I would suggest waiting 5-10 minutes to check if you need one since I did feel my skin was a bit oilier than usual. I have oily-combination skin, though. I used this mask at night and woke up to clean, hydrated skin the next day with no signs of any excess oiliness or breakouts on my skin. Results - My skin look brighter and fresher immediately after use and the effect was more obvious the next day. Toward the end of the day while washing my face, I thought my skin felt a bit smoother too. I am generally a bit hesitant to try out newer skincare products, and call me a snob, but I am wary of experimenting with a lot of the budget beauty brands. I have discovered a new skincare favorite, though, in the Look Beauty masks. Look out for more reviews on these soon as I can lay my hands on some at my local Target!